This seven piece dining set is a sleek addition to the dining room in your home. Featuring a clean white top, the table is lifted on a sturdy chrome finished metal base that provides structural support and a pretty accent. Rectangular in shape, it has extra space for guests and family gatherings. Accompanied are six contemporary upholstered chairs. 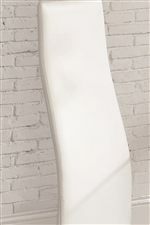 They have tall seat backs that are comfortable and attractive, and seats are upholstered in faux white vinyl for additional style. 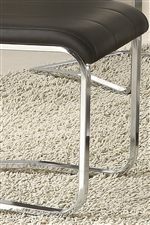 The chrome legs curve inward for a unique look and a cool, modern addition to your home. The Modern Dining 7 Piece White Table & White Upholstered Chairs Set by Coaster at Wilcox Furniture in the Corpus Christi, Kingsville, Calallen, Texas area. Product availability may vary. Contact us for the most current availability on this product. The modern dining collection makes it easy to craft a sleek, contemporary look in your dining space. With unique chrome finished bases and legs, it is easy to master the art of modernity. Chairs feature vinyl cushion seating in various colors as well as visually interesting details like tall seat backs for a funky aura. Discover the appeal of modern dining today. The Modern Dining collection is a great option if you are looking for Contemporary furniture in the Corpus Christi, Kingsville, Calallen, Texas area. Browse other items in the Modern Dining collection from Wilcox Furniture in the Corpus Christi, Kingsville, Calallen, Texas area.